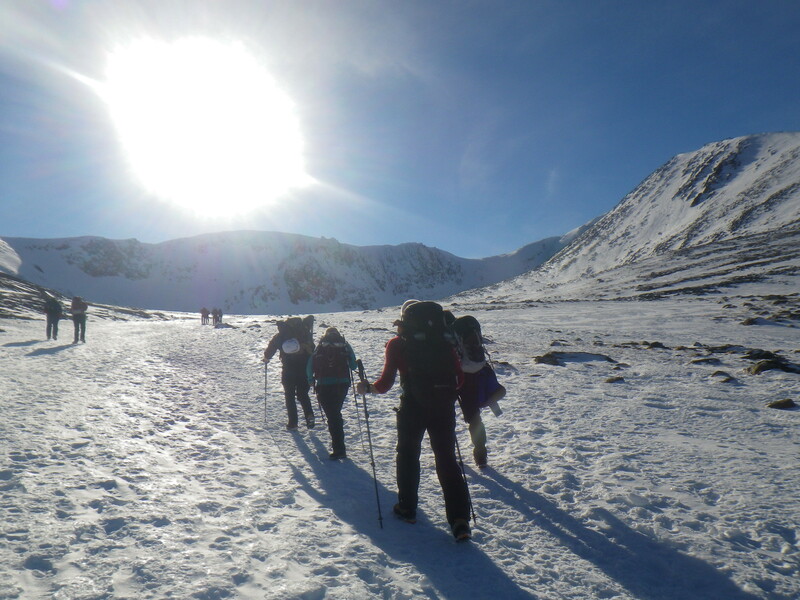 Tollymore Winter Courses are currently based in the Cairngorms Mountains in the highlands of Scotland. This area offers fantastic accessible winter walking, mountaineering and climbing at all levels. Scotland in winter has long been the testing ground for many mountaineers and for good reason. With its harsh winter climate of wind, snow and sub-zero temperatures it tests all your skills in mountaineering from navigation, fitness, judgement and technical climbing skills. Not every day is a battle though. If you are lucky enough you may find yourself in a winter environment with blue skies and stunning views. Our Scottish Winter Mountaineering and Climbing courses offer a range from intermediate to advanced level for those who want to push things a little further. As always with Tollymore courses we are not just there to guide you along, our main aim is to coach you and develop your own personal skills, to make you a more independent mountaineer. We find many people imagine winter mountaineering / walking is only for the ‘elite’ super fit brigade. Not the case. Over the years we have found that those who get the most out of our winter courses are reasonably fit hillwalkers who are confident on their feet. All Tollymore staff working on winter courses are all qualified to work in this environment and bring with them a wealth of personal experience from around the world.